When Joe Heaton was at Loyola Academy he dabbled in many sports. He was the point guard on the freshman basketball team. He made his high school hockey debut as a sophomore and was a member of the first Maroon team. He played football. He played lacrosse. He played golf. That was then. Now, at age 38, Joe is completely focused on coaching kids’ hockey teams, something he has been doing for the last 16 years. 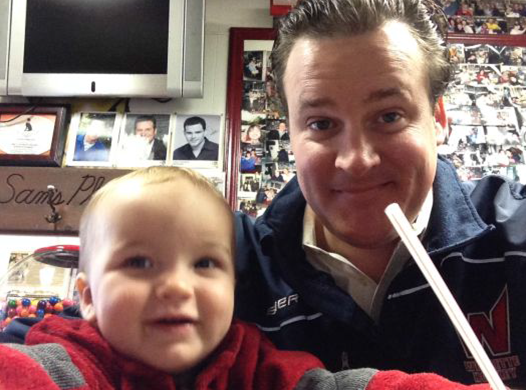 He is the head coach of the Wilmette Tribe Hockey Association’s Mite 1 and Mite 2 travel hockey teams, and his work with the boys and girls ages 6 to 8 is a labor of love. The multi-sport background that Joe brings to the rink runs in the family. His father, Mike Heaton, playedfootball and lettered in golf at Notre Dame after earning 16 varsity letters in football, baseball, basketball, golf and track at Marquette High School in Ottawa. His grandfather on his mother’s side is Jack “Moose” Sinon, who pitched for the White Sox in the 1940s. His cousin, Jason, Kipnis, is the Cleveland Indians’ second baseman. “I played many sports in high school but not all at the same time,” Joe said, recalling his own athletic career. “It’s great to have had that opportunity. As you get older you understand them and you can play them and can coach them. It translates well. I’ve coached basketball in the past and I’ve coached football at the grade school level. Hockey is the most skill intensive game there is. “We learned by watching a country like Sweden which had 1/10th as many players as us 10 years ago but put twice as many in the NHL,” he explained. “The Swedish model is a hybrid of the Russian model with a lot more smiles. Their model says you work on all the individual skills first. The team game comes second. “It’s making better use of your ice time. We end up putting more assistant coaches on the ice. You drill on one or two skills in a short time period. Then, you add on skills. With this age group what we’re doing is repetition—stops, starts, turns, stickhandling and passing. “When I was growing up very often the cart was put in front of the horse in terms of 'you need to play in this position; this is the play you need to make.'" But if we don’t teach skills first we can’t expect kids to make plays. When your coach is caught up winning and going crazy when you come off the ice because you’ve made a mistake that’s not a teaching moment. Joe and his wife, Meaghan their toddler son, Paddy, and daughter, Rita, who arrived in October, live in Evanston and he works as a commercial real estate appraiser, checking out industrial buildings and retail office buildings in downtown Chicago. His approach to coaching hockey makes it seem as though he would have be having a brilliant teaching career if he had pursued that profession after graduating from Xavier University. 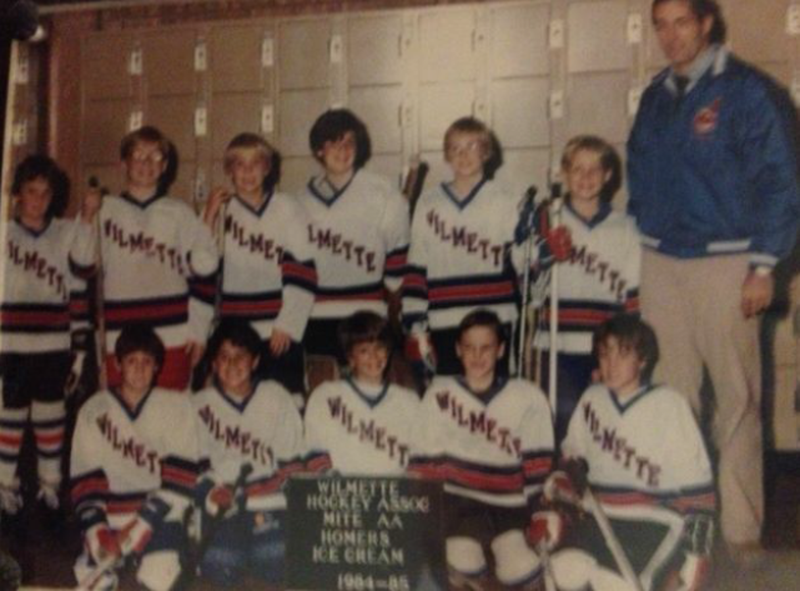 Coach Joe as a Wilmette Mite!